You'll be £8.99 closer to your next £10.00 credit when you purchase The Desert Air War 1940–1943. What's this? The war in air over North Africa and the Mediterranean during the Second World War has long been overshadowed by the battle on the ground. Between 1940 and 1943 Italy's Regia Aeronautica and then Germany's Luftwaffe waged a concerted aerial campaign against the British, yet apart from the bitter fight for Malta, this aspect of the conflict is rarely given the attention it deserves. Anthony Tucker-Jones, in this vivid photographic history, provides a fascinating introduction to it. The wartime photographs, and the concise text, cover the entire course of the struggle in the air. The Regia Aeronautica at first met weak British opposition when Mussolini launched his ill-advised offensive against British-controlled Egypt, but the obsolete Italian aircraft proved to be no match for the Allied fighters once the strength of the Royal Air Force built up. Then, when Hitler stepped in to help his hapless ally, the aerial struggle intensified, and the air forces of both sides were locked in deadly combat in the skies over Egypt, Libya, the Mediterranean and Tunisia. The wide range of Italian, British, German and American aircraft involved, the air and ground crews from all sides, and the conditions in which they operated and fought are all shown in this varied selection of photographs. 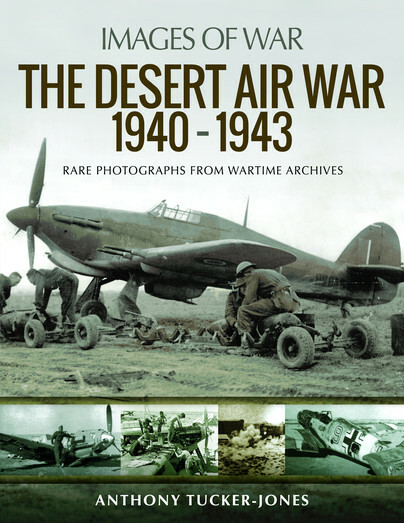 This is an excellent book, well-illustrated covering the air component of the Desert War very well, not just what was done, but the consequences of those actions. Understanding the desert war in north Africa is difficult if the air war is not taken into account. Most coverage of the air war in the Western Desert takes the well-trodden path of anecdotes from pilots and ground crew, and this book has examples of this narrative flavour too, but it is refreshing to find an account that also takes a wider view of the area of operations. Another addition to the Images of War series from author Anthony Tucker-Jones, though rather than the topic of military vehicles, this time he takes on a military aircraft topic. It is clearly a subject close to his heart, as there is a Dedication at the start to the people of Malta, an element of the story which is a particular part of the book, and the authors fascination for the island having lived there for a time with his parents... With RAF, Luftwaffe and Italian aircraft all well covered in here I thought it provides an excellent look at the work of the Desert Air Force between 1940 and 1943.